I love Tuna Salad and Chicken Salad sandwiches. 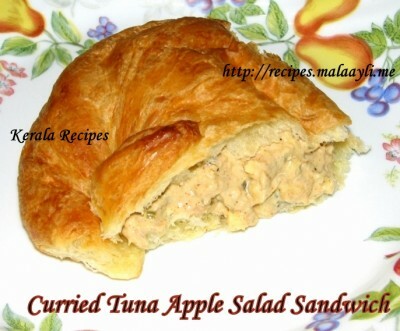 I once came across the recipe for making Curried Tuna Apple Salad in a magazine. 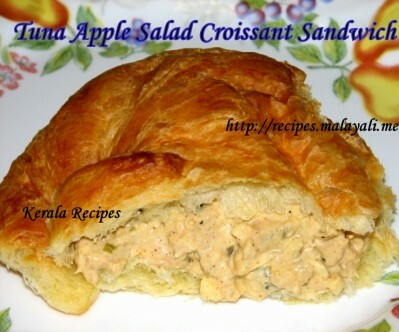 The combination of Apples and Tuna sounded funny to me but I was tempted to give it a try. 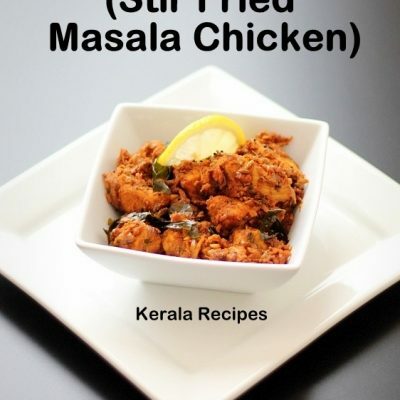 I didn’t have Curry powder and few other ingredients with me. My husband is not fond of Tuna Salad as he doesn’t like the taste of Canned Tuna, unless the Tuna has been further cooked with spices. 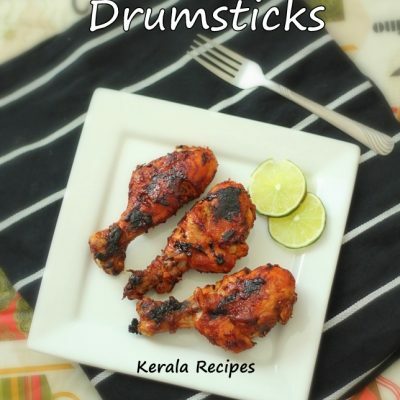 That’s when I thought of making a similar salad with Indian spices. I lightly fried the Tuna with spice powders before making the salad. This Indian Style Tuna Apple Salad tasted great and even better than the earlier Tuna Salads I used to make. We spooned this Salad onto our favorite Croissants and enjoyed it for Breakfast. It was so yummy. You can make mini sandwiches using this salad and serve it as appetizers. 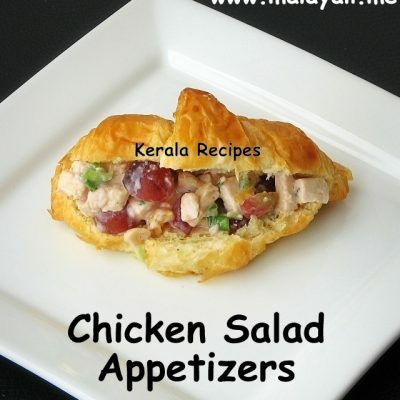 If you love Tuna Salads, then you ought to try this wonderful recipe. It’s so simple and tasty. The Calorie Conscious can replace Mayonnaise with Low Fat Mayo and substitute bread with Lettuce. Heat oil in a non stick pan and add the drained tuna flakes. Saute for a few minutes. 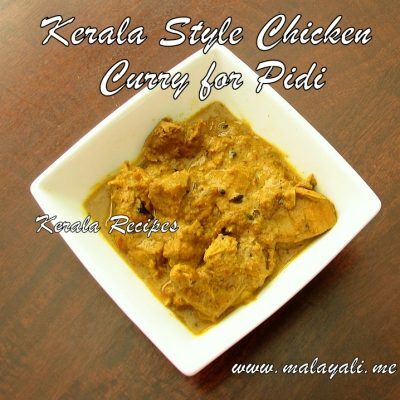 Reduce heat and add red chilly powder and chicken masala powder. Sprinkle salt and pepper. Continue sauteing until the tuna has changed color (5 minutes approx). Whisk mayonnaise, yogurt and pickled relish in a bowl. Add the cooked tuna flakes and diced apples. 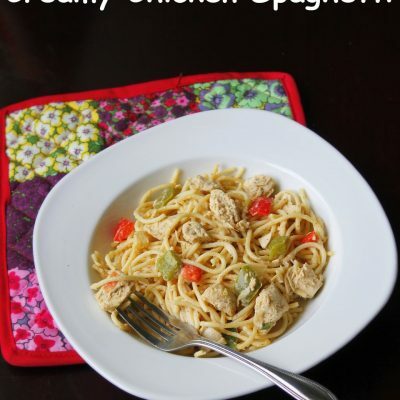 Toss everything together and sprinkle more salt and pepper if needed. Divide the croissant into halves. Take the tuna salad by spoonfuls and spread it on the croissant. You can make 2-3 sandwiches with this salad.